Sachin Tendulkar is legendary and has collected unimaginable fame, love and respect for himself by not just Indians but everyone around the globe. 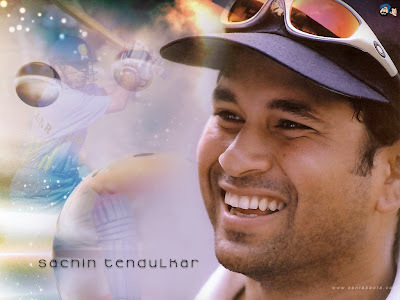 The pinnacle, Sachin has reached today, is result of many many years of hard work and determination. As students what are the 5 things we can learn from Sachin Tendulkar and achieve success in whatever we do? 1. Stay Committed - There are no shortcuts in the road to Success. But if you stay committed and do not give up in the middle, you are sure to succeed. Never stop to put in hard work. 2. Match begins way before the actual match - This means that preparation must not be last minute. Small efforts made daily from the Day 1 will prepare you very well for the exam day. 3. Let defeats not depress - In the innumerable records Sachin has made in his career, there have been some defeats and criticism. Sachin's strength of character always made sure they motivated him. As a student we also see many hardships, bad scores etc. Our main aim should be to let them only motivate us to do better, to improve. 4. Do not compare - One thing that Sachin always does is to improve on his own game and never see what others are doing. The goal is clearly defined and every one reaches that in a different way. Only compete with yourself, get better marks than what you got last time. Comparing with others creates unnecessary complexes. 5. Stay Humble - Sachin, the little master, has not an iota of over-confidence of what he has achieved. He knows "there are many miles to go before one sleeps". We must remain humble and aware of our shortcomings and keep working on them. This will help us go higher and higher in our lives. In the end, we wish everyone becomes Sachin Tendulkar in their own respects, it only requires extraordinary discipline and persistence. Start working towards your dream of becoming an engineer or a doctor TODAY! Prepare yourself for success. Check out tips to train your mind and body.